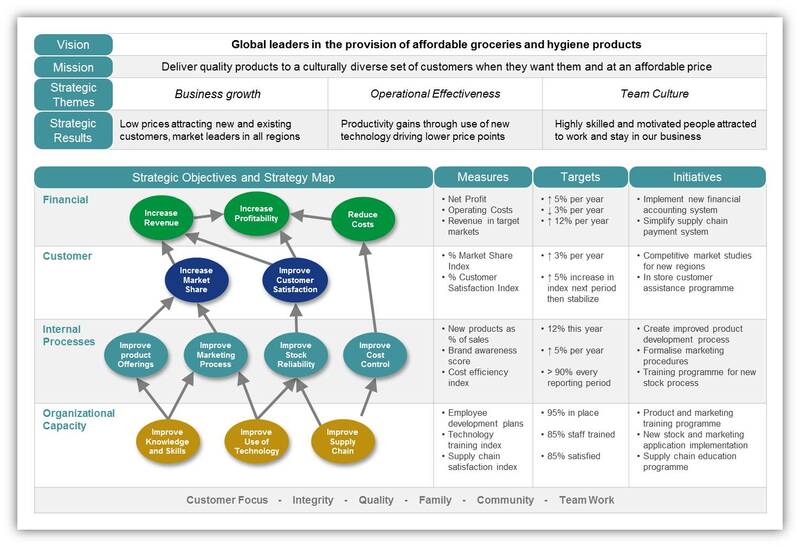 A strategy map provides the visual foundation of a business strategy. It provides the means by which a business can communicate its strategic plan to customers, employees and stakeholders. As such, it is probably one of the most powerful documents a business can create. Whether you are working in a company of 5 or 5,000 you want to know what your company is trying to achieve. You want your leaders to be visionary and have a strong sense of where the business is going. You want to be sure your company has ambition, the right plans in place and will be around for the long-haul. For this, the strategy map has become the communication tool of choice. On a single page, the whole story can be laid out. If constructed correctly, links can be seen from the resource level and organisation capacity requirements through to required process changes. These in turn will impact customers and finally financial results. A strategy map is usually tiered. One for the whole business and several for each division and department. These are also linked, never losing sight of the business vision and goals. The only criticism of a basic strategy map is the lack of a link to measures, targets and initiatives. These things have to be in place but are not usually described on the ‘public’ view of the strategy map. This can be a mistake. By failing to include this detail, the value of the strategy map is greatly decreased. Here we can see, at a glance, not only what the business is trying to achieve, but how it is going to go about it and importantly how success is going to be measured. This very public demonstration of intent can generate a high degree of confidence both internally and externally. A satisfying by-product is that these people involved in the creation of the Integrated Strategy map become fully bought into the process and the strategy. The Integrated Strategy Map is a concept created by the Balanced Scorecard Institute and is fully described in their book The Institute Way. Intrafocus, an affiliate of the Balanced Scorecard Institute run classes on the Balanced Scorecard Methodology.